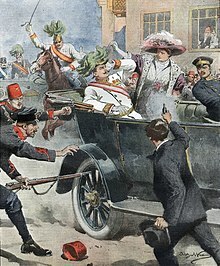 The assassination of Archduke Franz Ferdinand of Austria, heir presumptive to the throne of Austria-Hungary, and his wife Sophie, Duchess of Hohenberg, happened on 28 June 1914 in Sarajevo. They were shot dead by Gavrilo Princip. Princip was one of a group of six assassins (five from Serbia and one from Bosnia). The leader was Danilo Ilić, a member of the Black Hand secret society. The political reason for the assassination was to break off Austria-Hungary's South Slav provinces so they could be combined into a new country, Yugoslavia. This soon led to the outbreak of war in Europe at the end of July 1914. Austria-Hungary declared war on Serbia. Both country's allies became involved in the war, and soon most of Europe became involved. This page was last changed on 9 March 2019, at 17:26.